Directory >> Bishops >> Jagdalpur Eparchy >> Mar Simon Stock Palathra C.M.I. Mar Simon Stock Palathra C.M.I. 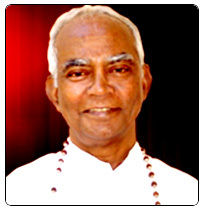 BISHOP SIMON STOCK PALATHRA CMI, was born on 11 October 1935 as the son of Mr. Philip and Mrs. Mary Philip Palathra in the Archeparchy of Changanacherry. After his High School Education in St. Berchman's Changanacherry and St. Epherm, Mannanam he joined the CMI Congregation in 1954. He made his first religious profession on 16 May 1958. He had his Major Seminary formation at Dharmaram Vidya Kshetram, Bangalore and was ordained priest on 1 December 1964. From 1972 till 1977 he was the Pro-Exarch of the Exarchate of Jagdalpur and later till 1982 as its Vicar General. He was the Provincial Superior of the Jagdalpur Vice-Province of the CMI Congregation for two terms, from 1981 to 84 and 1987 to 90. He was nominated bishop of Jagdalpur in 1993 and was ordained Bishop on 19 March 1993.